No matter how hard you study, no matter how hard you try to manage risk, there’s a good chance you’re going to badly overdraft at least one player. Even the best of us end up with first-rounders who perform like 15th-rounders. What’s important is figuring out what to do once you’ve made that kind of mistake, then learning a lesson for the future. So you can call this a venting session, and a teachable moment. Here are 10 of this year’s biggest Fantasy Murderers. 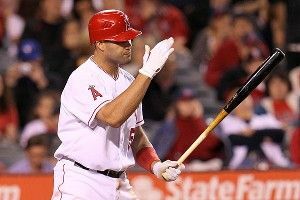 Albert Pujols (ADP 1, PR 370): It’s the American League’s tougher competition. No, it’s the pressure of his $240 million contract. I dunno, kind of looks like his swing has fallen apart. Whatever is plaguing Pujols, it doesn’t get much worse than this spring’s consensus top pick sitting at no. 370 in value more than a quarter of the way through the season. Pujols is hitting .213/.258/.331; his career lows in batting average, on-base percentage, and slugging average are .299, .366, and .541 (all set last year). His 5.8 walk rate is the worst of his career, his 12.1 strikeout rate the second-worst. He’s low enough in several luck-influenced stats that you have to think a rebound is coming soon: .224 batting average on balls in play (career .309), 6.9 percent home run–to–fly ball rate (career 19.4 percent). Given his strong 20.9 line drive rate (fourth-highest mark of his career), you’d expect more balls to fall in for hits, and given his clean slate of health and track record of immense power, you’d expect more homers, too. Still, even the biggest optimist would concede that Pujols is probably at least a bit past his prime, in year one of a 10-year deal no less. Even if he somehow returns to peak Pujols form and stays there for the rest of the season, there’s no chance in hell he’ll do enough by year’s end to justify his top-pick status. He probably won’t even come close. This doesn’t explain everything, of course — there are plenty of hitters with similar or worse batting eye numbers who are on pace for more than 11 lousy home runs. And these things often move in the same direction, too, such that one homer hot streak could cause Gonzalez to stop pressing, get more selective in what he swings at, and also earn more respect from pitchers. But in last week’s Fantasy Fiesta, we noted how a hitter’s seasonal strikeout rate tends to stabilize at 150 plate appearances, his walk rate at 200 plate appearances. Gonzalez now has 198 PA for the season. Throw in less on-base ability ahead of him (Mike Aviles has been fine, but he ain’t 2011 Jacoby Ellsbury), and you have to temper Gonzalez’s projections at least a little. Jose Reyes (ADP 21, PR 132): If there’s one player here worth offering full draft-day value (or very close to it) to acquire, it’s Reyes. The steals are already there, with Reyes on pace to flirt with 50 swipes, which would be his highest total in four years. He’s walking more often (11.6 percent BB rate) and striking out less often (7.1 percent K rate) than ever before. His .277 BABIP isn’t terribly far off league average in the low .290s, but a speedy player like Reyes tends to squeeze more out of balls in play, and his career number (.312) confirms that. The only major performance drop that lacks an obvious answer is his Isolated Slugging (slugging average minus batting average), down to a career-low .082. ISO is one of the offensive stats that takes the longest to stabilize, typically about 550 plate appearances. The new Marlins ballpark might be tough on home run output, but Reyes isn’t going to end the year at zero, and the smart money’s on his doubles and triples pace picking up, given how far he sits from career norms. By all appearances, there’s nothing wrong with Reyes other than a random slow start. Mark Teixeira (ADP 24, PR 246): Teixeira is a notorious slow starter, with a career second-half OPS 76 points higher than his first-half mark, and April being his worst month by a mile. Still, this year’s numbers (.226/.291/.381, five homers in 41 games) are worse than even the worst starts of his career. A bronchial infection has plagued him all year long, so there’s hope that Teixeira at least regains his usual power pace and ends the year somewhere around 30 homers. But his days of .300 batting averages are long gone, spurred by drops in his speed and line drive rate. Even if he does reach 30 home runs this year, it’s safe to say he’ll never gain a top-25 preseason draft position again. Tim Lincecum (ADP 29, PR 580): We tried to explain it, way back with his second start. Six weeks later, Lincecum remains an enigma, armed with Randy Johnson’s strikeout rate and Randy Jackson’s odds of winning another Cy Young this year. His velocity is certainly down. There’ve been rumors of a possible injury. It might be bad location, bad luck (6.04 ERA vs. a 2.92 FIP), or just a case of a good pitcher gone bad. Even if you’re a believer, though, trying to acquire Lincecum might be a fool’s errand. As frustrated as his owners might be, it would take a lot of pride-swallowing for him to get sold as anything else than a top-50 ADP guy. This despite ranking alongside Micah Owings and Mike Zagurski in year-to-date value. Might as well try to buy low on someone else. Eric Hosmer (ADP 47, PR 428)/Matt Moore (ADP 75, PR 575): Here’s your reminder to never again overdraft a young player on hype and potential. Moore was a consensus top-three prospect coming into this season after dominating the minor leagues and looking unhittable in a September call-up and playoff stint with the Rays. Hosmer was a Rookie of the Year contender in 2011, whacking 19 homers, knocking in 78 runs, and hitting .293 in 128 games. Both have been fantasy black holes this season. There are some extenuating circumstances: The lowest BABIP in baseball heading into Wednesday’s games for Hosmer (accounting for his sub–Mendoza Line batting average) and a strikeout rate of nearly one per inning for Moore, suggesting he’s still doing some things well. Still, both players have shown significant holes in their game, which can and does happen when you expect 22-year-olds with less than one year of major league service time to suddenly blast off. Players like Moore, Hosmer, Desmond Jennings, and Brett Lawrie are going to get overvalued every year for their potential. Better to go with known commodities than set yourself up for young-player regret. hey there, A.J. Ellis) has proven a highly effective strategy so far this year. Yovani Gallardo (ADP 61, PR 399): Much of a starting pitcher’s value is derived from his win total, and Gallardo’s low total (2) doesn’t match up with his respectable underlying stats (3.83 FIP). Still, Gallardo’s walk rate (4.44) is nearly a run higher than his career mark and just shy of his worst number in 2009. He’s inducing fewer ground balls, giving up more line drives, and his fastball velocity’s down a tick from 2010 and 2011 levels. With a decimated Brewers lineup producing less run support than in recent years and also faring poorly on defense, it doesn’t look like Gallardo’s going to get a ton of help, either. He’ll surely finish better than 399th by year’s end, but I wouldn’t necessarily pencil him in for top-100 status at this point. Heath Bell (ADP 128, PR 446): Of the 30 pitchers who held their team’s closing job on Opening Day, only 15 still hold the job today. One-quarter of the way into the season, and half the damn league’s turned over. The thing is, everyone knows this, and the “never pay for closers” philosophy might be stronger than ever next spring. That approach ignores the value of investing in elite and consistent stoppers like Jonathan Papelbon (Mariano Rivera’s freak injury doesn’t negate his decade-and-a-half run as the most reliable player in baseball). It also ignores the value of the IDGAC plan. We all know many closers are going to fail. But most people still don’t want to punt saves, and their desire to address the category will only grow as the year goes on. The most effective strategy I’ve seen is to let the draft (and especially auctions) come to you, inevitably end up with three, four, or even five closers, then shop the hell out of them as quickly as possible, even before Opening Day. That way you can take advantage of other teams’ needs and get more in return than what you paid at the draft table. Best of all, you won’t have to sit and wait for Heath Bell to turn into a pumpkin.